Abdel-Aziz F. A. (2008) Diversity of aquatic fungi on Phragmites australis at Lake Manzala, Egypt. This study extends our knowledge of the biogeography of higher aquatic fungi from lakes in Egypt which have not been well explored. Diversity of aquatic fungi in Lake Manzala in Egypt was assessed, and fungi dominating the communities were recorded and compared with those from other lakes in subtropical, tropical and temperate regions. This study represents the first report of aquatic fungi from Lake Manzala . Three hundred submerged woody samples of Phragmites australis were collected randomly from three collection sites (Manzala 1, 2, 3) and were investigated for the biodiversity of saprobic fungi. 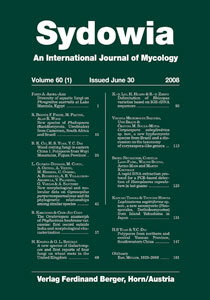 Sixty taxa including 26 ascomycetes and 34 anamorphic fungi were recorded, of which 19 fungi are new records for Egypt . The most common fungi overall the three sites were Periconia prolifica (18 %), Leptosphaeria oraemaris (8.7 %), Phoma hedericola (6.7 %), Alveophoma caballeroi (6.3 %), and Phoma epicoccina (5.3 %). The most common fungi were different from one site to another and different from common fungi that have been recorded from lakes in subtropical, tropical and temperate regions. Keywords: brackish fungi; ecology; ascomycetes; anamorphic fungi; subtropical fungi.